Home > Travel > Flight > Budget Airlines > Jetstar: S$0 Friday FREE Fare Frenzy to Bangkok, Phuket, Penang, Taipei & More! 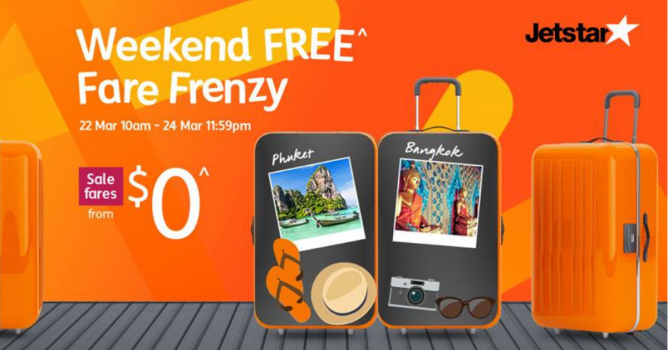 Book by 24 Mar 2019 Jetstar: S$0 Friday FREE Fare Frenzy to Bangkok, Phuket, Penang, Taipei & More! Jetstar's epic S$0 Friday FREE Fare Frenzy is now on! S$49.80 one way ALL-IN to Siem Reap, Bangkok, Clark, Taipei! T&Cs apply. Sale ends Sunday 24 March 11.59pm SGT, hurry and book now! Promotion: Jetstar S$0 Friday FREE Fare Frenzy to Bangkok, Phuket, Penang, Taipei & More! S$0 fares are limited, and are not available on all flights. Please check applicable travel periods at jetstar.com/sg/en/deals/weekend-free-fare-frenzy. Fares quoted are for one way and do not include taxes. Airport taxes and fees range from S$49.80 to S$67.89. A booking and service fee of $5 - $10 per passenger, per flight will apply. Available until sale ends or fare is sold out. Not available on all flights or days. Other conditions apply. Previous: Starbucks: Japan Exclusive Sakura Collection + Sakura Bearista® Cup Lid Now Available in Singapore! Next: [H&M] Ready to welcome the spring florals?